Hallidie Plaza contains a monument to Andew Hallidie, who developed the world's first cable car system and tested the first cable car in San Francisco in 1873. The monument lies at the turntable for the Powell Street cable-car line. 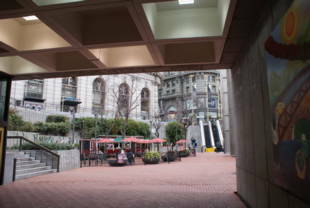 The plaza includes the Benjamin H. Swig Pavilion, home of the San Francisco Visitor Information Center. 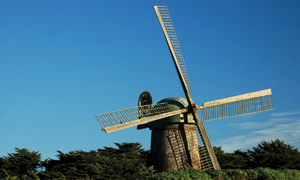 The Visitor Center provides assistance such as booking city tours, making restaurant reservations, or answering general questions. Benjamin Swig was a real estate mogul and philanthropist who invested in hotels such as the Fairmont as well as investing in the downtown high-rise development. 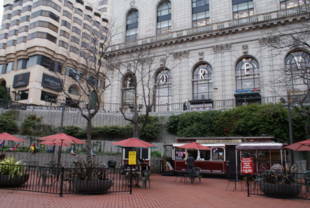 Hallidie Plaza is owned by the Department of Public Works. Hallidie Plaza opened in 1973 to commemorate the one hundred year anniversary of the invention of the cable car by Andrew Hallidie. 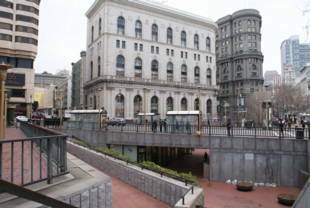 The plaza was built as a sunken, three-level gathering place in one of the busiest areas of San Francisco. However, over the years, drug dealers, criminals and homeless people started congregating in the plaza. In reaction, the city cut down most of the trees and removed the benches in 1998. Over the last few years, the city has stepped up its efforts to restore the plaza to its original vision. 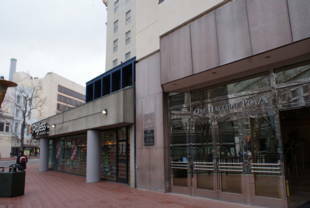 The Department of Public Works has increased its cleaning efforts, and in 2004 the city and a number of local businesses sponsored a design workshop for the plaza. Market St. and Cyril Magnin St.